Because of its smoothness, it is often referred to as the Rolls Royce of the standard dances. It is what Fred and Ginger used to do so well. “The object of smooth dances is to move or travel smoothly around the room, covering as much of the dance floor as possible. The couple should be streamlined, two people moving as one, gliding fluidly and forcefully around the dance floor. Imagine a room filled with stiff whipped cream. The dancers’ goal is to move smoothly and powerfully through the cream, charting a clean path without disrupting any of the cream around them.” This is one of the best descriptions of our goal in smooth dancing. It is from the book, “ABC’s of Ballroom Dance”. It is generally believed that a Vaudeville star by the name of Harry Fox began what today we call the Foxtrot. In the summer of 1914 Harry and his company of “American Beauties” put on a dancing act in the New York Theater. As part of his act, he was doing trotting steps to ragtime music, and people referred to this dance as “Fox’s Trot”. When the British dance masters imported this American ballroom dance to England, they smoothed away the trotting, hops and kicks to a much smoother version which has endured over the years. 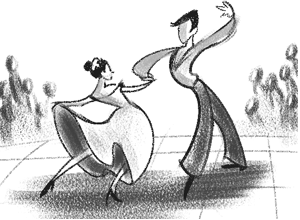 The origin of the Spanish-styled Paso Doble dance represents a bullfight, where the lead takes the role of the bullfighter, while the follow takes on the flare of the red cape of the toreador and not the bull, as often assumed. Together, the lead and follow move dramatically, often changing roles as they move around the imaginary bull, while they present flamenco elements and feature arena fights with stylized figures. Its present form was created in France and since 1959 it has been one of the five dances of the Latin American program of international ballroom competition. In terms of its usefulness in your dance development, it is probably the best dance for your development of a strong and stylistic frame, one of the great challenges beyond learning your footwork.